What sort of cookie website would this be if I didn’t include a chocolate chip cookie recipe? These come to you based on a recipe from Williams Sonoma’s Essentials of Baking, which was my bible in my nascent stages of bakerness. 1. Position a rack in the middle of the oven and preheat to 350oF. Line 2 rimless baking sheets with parchment paper. 2. In a bowl, sift together flour, baking soda, and salt. Set aside. 3. In a large bowl, combine the butter, brown sugar, and granulated sugar. Beat on medium speed until smooth. Add the egg and vanilla and beat on low speed until well blended. Slowly add the dry ingredients and beat on low speed until just incorporated. Mix in the chocolate chips. 4. 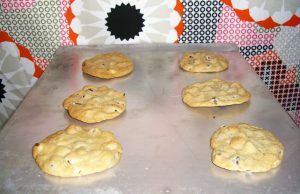 Drop the dough by heaping tablespoons on to the prepared baking sheets, spacing the cookies 2 inches apart. Bake the cookies, 1 sheet at a time, until the edges and bottoms are lightly browned and the tops feel firm when lightly touched, about 10-13 minutes. Let the cookies cool on the baking sheets for 5 minutes, then transfer them to wire racks to cool completely. NOTE: Chocolate chip cookies are amazingly versatile. You can make the basic dough and then mix in any number of things (chocolate chips, nuts, dried cranberries, raisins, etc.). Experiment! It’s fun!